For commercial use of this photograph please visit www.alamy.com and search for RJ9YPH but for a one off print, please see below. 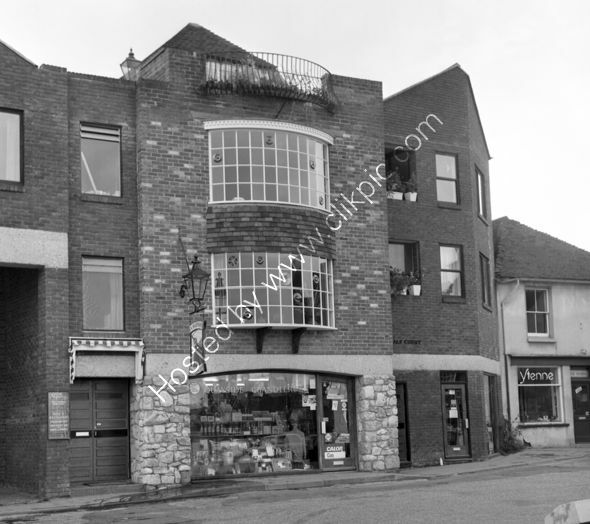 The focus of this photo taken before 1975, was to be the Slipway bar and restaurant on the town quay in Lymington. The doorway is shown along with the hanging sign - the bar and restaurant are behind the bow windows above and to the right of the doorway. Research in 2019 revealed the following:- The Quayside Chandlery, shown in the photo is in 2019 the Boat House Cafe; The doorway to the restaurant is, in 2019, the doorway to apartments called Quay View and they presumably now occupy what was the bar and restaurant; The unit to the left appears unused and boarded over and a place to park cars. The Chandlery has now moved here and is Yachtmail Chandlery. The lantern over the pub sign has survived since pre 1975 and is now over the cafe and has been matched (almost) by a similar lantern to the RHS of the cafe.